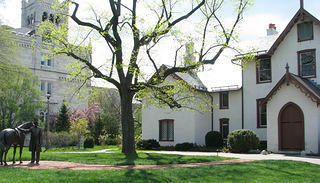 An Armed Forces Retirement Home (AFRH) building is just beyond President Lincoln's Cottage. For three summers, Abraham Lincoln and his family resided in a hilltop cottage on the grounds of the Soldiers' Home almost five miles from the White House. Open since 2008, President Lincoln’s Cottage—a historic site of the National Trust—has been interpreting and sharing stories of Lincoln’s time spent there. But what many visitors don’t realize is by the time President Lincoln moved to the summer house in 1862, the “asylum for old and disabled veterans” had already been serving the community over a decade. Established in 1851, the Soldiers' Home—today called the Armed Forces Retirement Home (AFRH)—was once host to more than 1,000 retired and disabled veterans. What’s more surprising? Veterans still live there today. So when visitors take the same four-and-a-half mile trip from downtown Washington to see the Cottage, they are also visiting the home of more than 400 formerly enlisted men and women. 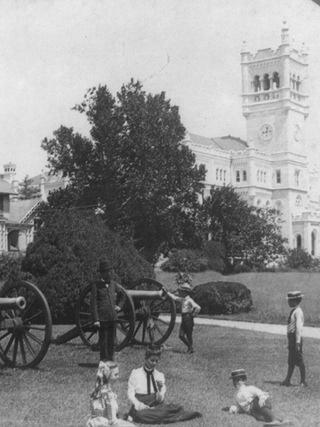 The Soldiers' Home campus in 1904. In this way, the AFRH represents the living history of the site. Just as Lincoln was, visitors are surrounded by the veterans who live at the facility, some of whom even volunteer as greeters at the Cottage. After leading the charge for the cottage’s restoration less than 10 years ago, the National Trust took over as stewards of the structure, which remains embedded in the retirement home’s campus. Established as a private/public partnership between the National Trust and the AFRH, Lincoln’s Cottage gives visitors an intimate look at Lincoln’s life there and how being surrounded by the militiamen impacted his thoughts and actions during the war. “There are a lot of people who have just never heard of this place, so there’s this great sense of discovery when they figure out exactly what Lincoln was doing here,” says Carlson Mast. In fact, some visitors discover that they themselves are eligible to live at the AFRH. Prohibited from advertising for legal reasons, the AFRH relies on word of mouth to fill the vacancies.